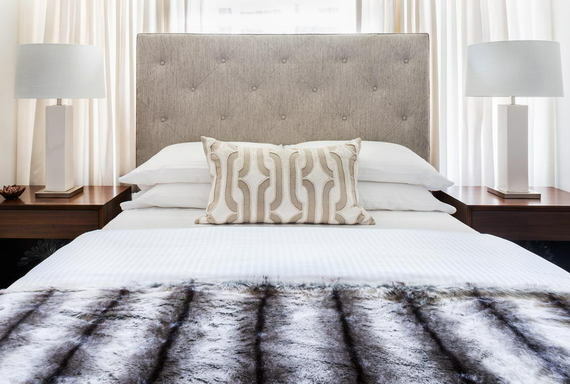 One of the most versatile pieces you can own is a good faux fur throw blanket: they can be used to dress up a room in a multitude of ways, and they carry timeless elegance while also giving perfect practical comfort. 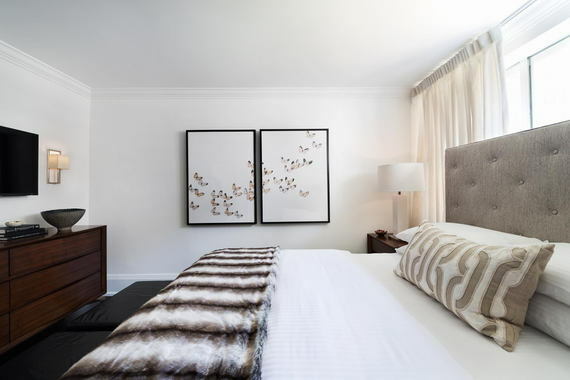 I love using one in a bedroom, like in this Toronto Interior Design Group project (tidg.ca), or in my my own home. Folded neatly at the end of a bed, a fur throw gives drama to classic white linens, and echoes the look of cozy lodge retreats--it only adds a second or two to the process of making the bed, but it really completes the look. Don't be afraid to use a blanket with a sense of pattern in it. Mixing patterns can sometimes be tricky, but nature-inspired faux fur patterns can be thought of as a wild card--they rarely clash with other patterns, so you can mix them easily with geometrics or prints (or both) without worry. When in doubt, a simple stripe is a no-fail option that ups the drama factor. Toss pillows are another easy way to add a little luxe tactile fur to your style. You can use them on their own, or mix them in with other fabric pillows for contrast--and you can always move them to the back or the front of the arrangement to determine exactly how much fur will show. 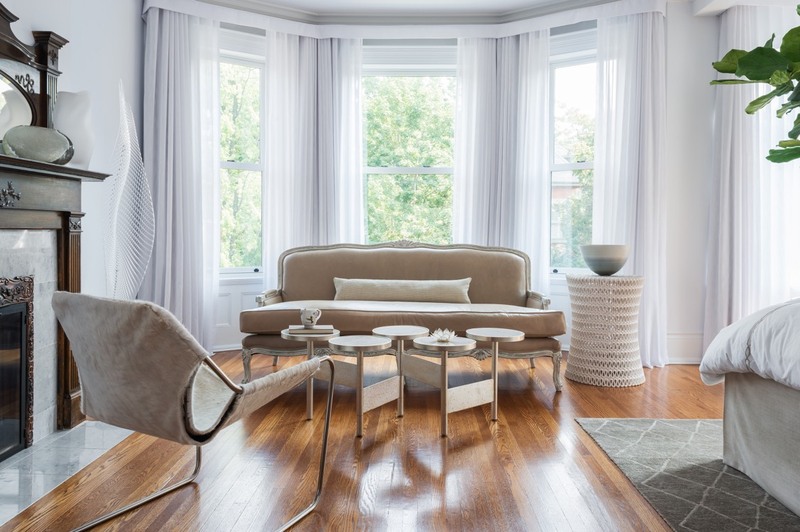 Sheepskin and sheepskin-inspired shag pillows add a similar touch-me texture that gives any room a high-end air, without feeling stuff or uninviting. 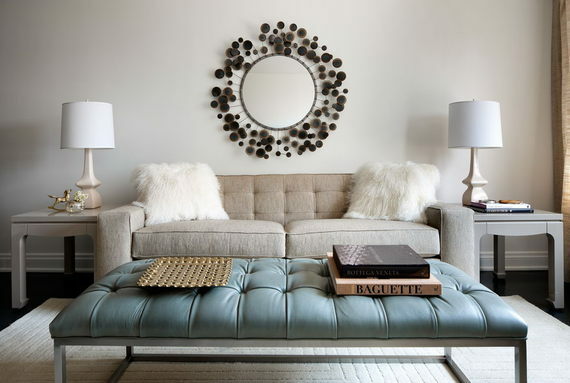 The best thing about fur pillows and throws is that they can be easily moved from room to room to switch up the look whenever the mood strikes, or folded away between seasons to lighten the look for summer. A quality blanket will look just as great casually draped over a sofa as it does when meticulously folded, so you can keep trying new ideas--it doesn't take much effort to get a great result. It should be noted that fur isn't only for accessories--it makes an even bigger statement to use the material for a piece of furniture, such as an elegant side chair. It may not stand up to as much wear as a tight cotton, but for lightly used pieces of furniture it gives them a stunning look with a sense of true luxury. There are many colour options for faux furs. When it comes to fluffy shearling pillows, rich dyed colours can be striking and sophisticated, such as a fresh minty green hue or a deep merlot. However, the safest bet for furs is to stick to natural, neutral hues, like black, greys, and browns. A contrasting black and white fur, such as in the image at the top of the article, is classic and dramatic, and gives an air of fashion. This sort of high-drama colour statement tends to work well with cooler colour schemes, and crisp decor. Brown-based colourways will tend to be the choice for warmer interiors, with more subtle or more eclectic design--however as you can see in the photo above, a brown fur also looks luxurious and inviting in a modern space as well. Ultimately the most neutral tone for a fur blanket will always be a soft grey, skewing neither strictly warm or cool on the colour wheel, but simply bringing pure texture and pattern. This is a great safe-bet option for those who want to add rich detail, without shocking their colour palette. I recently discovered the beauty of a heated throw, like this reversible model from Sunbeam. 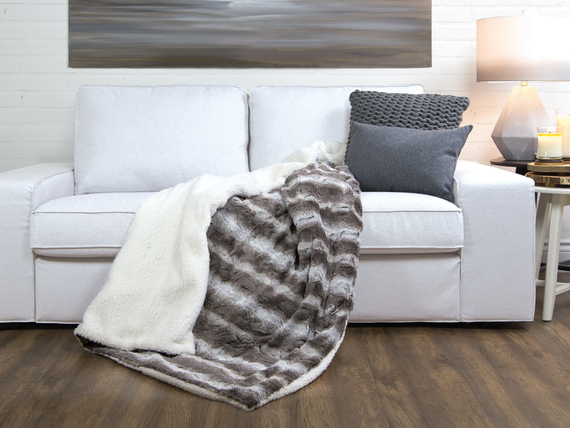 It has a rich grey faux fur on one side, and a sherpa layer on the reverse, so you can switch up the look by folding or draping it in different directions--either way the warming technology inside gives you a cozy winter escape in any room without jacking up your heating bill. pure colour will look much more artificial. Hair length: super short "hair" strands, typically found on very inexpensive accessories, don't tend to look like fur so much as synthetic fuzz, especially when rendered in a fur-inspired colour pattern. Look for faux fur with longer hairs that better simulate actual animal hide. Sheen: this one is harder to define, but there is a definite artificial sheen to some polyester faux fur fibres, so make sure to look at one you're considering buying under good light, especially if you're browsing in a boutique with more dim ambient lighting. Shedding: real animals shed, but a good faux fur shouldn't lose a ton of fibres every time you stroke it. Get your fingers on the material and see if a large number of fibres come off onto your hands--if they do, just imagine what that piece will look like after a few seasons of use! Want to see more luxurious looks to inspire your decor? Visit my design firm's website at tidg.ca, and check out my Twitter and Instagram via @yanicsimard. See you there!